Posted by Danny Collins on April 5, 2018 in Sports, Top Dawg. This week’s Top Dawg had an outstanding weekend on the tennis court as the No. 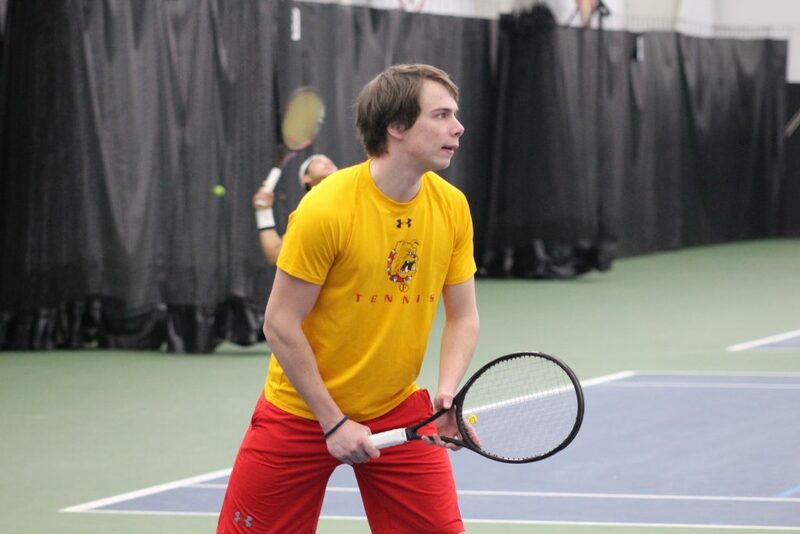 23 nationally- ranked Ferris men’s tennis team held onto first place in the Great Lakes Intercollegiate Athletic Conference (GLIAC) standings. Senior Daniil Tarantinov had a dominating weekend of play as the Bulldogs defeated the Northwood Timberwolves 7-2 on Thursday, March 29, and the Grand Valley Lakers 7-2 on Saturday, March 31. Against the Timberwolves, Tarantinov won both singles matches 7-6 and 6-4. Tarantinov also paired up with sophomore Austin Debruyne to win the final doubles match 8-4. On Saturday, Daniil would continue his success as he went 2-1 in singles play and won his double match with Debruyne once again 8-4 over the Lakers. Overall, Tarantinov went 6-1 on the weekend to help aid the Bulldogs to their 11th straight victory. The team will be back in action against Edinboro, Pennsylvania, in a non-conference matchup on Friday, April 6, in Ohio. Click here for the previous Top Dawg from the men’s tennis team.